Green Mountain Grills has one of those typical stories. It starts with a man with a pellet grill who knew that he could make it better. Because of the Traeger brand's expired patents, there was a flood of pellet grills on the market. Green Mountain Grills was another company looking to break into it and after a few years, their grills were perfected. While simple in some ways, there is a lot of thought that has gone into this pellet grill, which is probably why it is the company's most popular model. Whereas other brands charge extra for certain features—in both comparable and higher-priced models—these features are included in the Daniel Boon pellet grill. Its excellent price and extra features make it safer and more functional than some of the other models on the market. 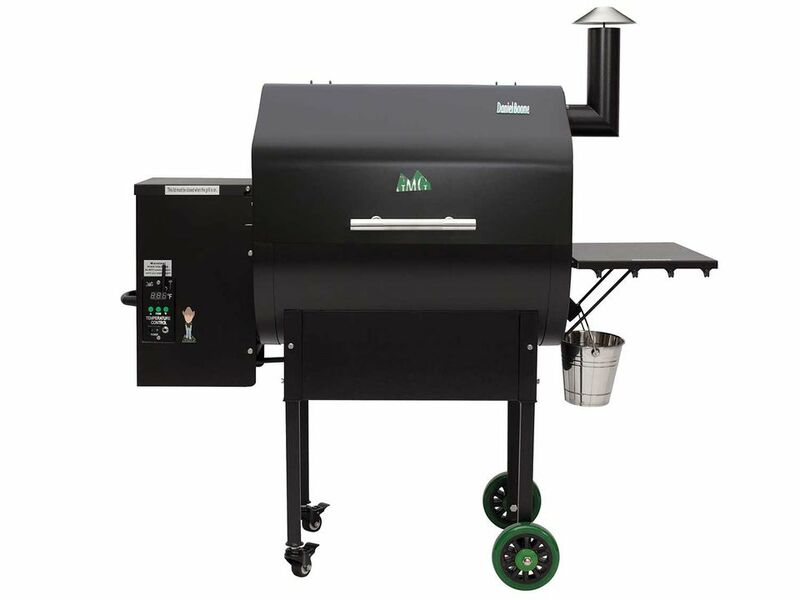 The Daniel Boone pellet grill is made up of several components: pellet hopper, auger system, a thermal sensor, firebox, digital controller, and grease bucket. The way this grill functions is that the auger—powered by a motor—feeds pellets into the firebox where a hot rod and combustion fan ignite the pellets and keep them burning. Two types of air flow systems create the ideal environment for a wood-burning fire to produce pure hardwood smoke flavor—the vents inside the venturi-style firebox and a fan inside the pellet hopper—boosting combustion and controlling temperature. The Green Mountain Daniel Boone's side-mounted pellet unit has a 17-pound capacity. The enclosed cooking chamber features a peaked lid for when cooking stand-up chicken, large fowl, or using rib racks. This pellet grill has a temperature range of 150 to 500 F and can be adjusted in five-degree intervals. Of course, this is an electrically powered unit. The digital controller is standard and it includes a meat probe so you can take instant food readings inside your grill. Also included is an attached side tray with utensil hooks and hard rubber tires. The Daniel Boone model is also offered (for an additional cost) with a digital WiFi controller, which allows you to control the grill from your smartphone, including changing the grill temperature, monitoring the food temperature, setting a timer, and creating food profiles. Other available options for this grill include a stainless steel no-warp lid, form-fitted grill cover, and a dome thermometer. The Green Mountain Pellet Grills have a few unique features, making the Daniel Boone model stand out from the crowd. This grill has a positive pressure fan to keep sparks out of the auger (sparks can start the dreaded hopper fires), with a fan-only mode and automatic shut-off to keep ash out of the firebox after you finish cooking. And no need to wonder if you are low on fuel—a hopper alarm goes off when the pellet supply gets low. This grill also has a heating system called Sense-Mate, which is an automatic sensor that detects whether the air outside is cold—if so, it will activate a turbo-mode booster to get the grill up to the desired temperature faster, allowing the grill to achieve high temperatures in cold climates. In addition to these standout features, the Daniel Boone offers excellent temperature control, a wide cooking range, and a large-capacity pellet hopper. It is a smoker/grill that provides a wide temperature range while being versatile, thanks to its control unit. These are the attention-to-detail features, along with high-quality standard components, that makes for a good product. Another positive about this grill is that there really aren't many negatives. The facts that thin metals don't hold the heat well and that the maximum temperature is 500 F could be deemed cons, but considering the number of favorable features the Daniel Boone offers, they certainly outweigh any disagreeable points. Green Mountain Grills are sold exclusively through independent dealers, and the manufacturer provides a link on their site for dealers near you.